All of the flavors of a Caprese Salad in a spread you can you use for sandwiches, pizza, potatoes, eggs, you name it! Pulse until well-combined and the spread is the consistency you like. This spread should keep for a week in the refrigerator or three months in the freezer. 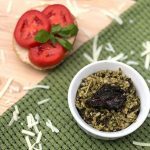 If you don't want to make your own pesto, using store-bought is fine.